In high school I dated a boy who played lacrosse, loved snowboarding, and hated rap music. In order to "guarantee” the success of this relationship, my sweet little high school brain derived a foolproof plan to ensure he would always like me. I just needed to like everything he liked. Seemed logical enough. So, I headed straight to google where I researched everything I could about lacrosse and snowboarding. I was practically an expert after I read through all the pages I had printed out. I even loaded my iPod with the bands he loved and stopped listening to my beloved rap music. Despite my efforts, he dumped me. I couldn’t possibly understand why. I did everything I could to be exactly what I thought he wanted. You would think that after this experience I would have learned, but... I didn’t. A few boyfriends later I did nearly the exact same thing. I stopped wearing my high top converse or doing my makeup as requested by my current "bf". I wanted to be who he wanted me to be so bad that I was willing to give up who I wanted to be. Looking back I wish so badly that I had just been me. For whatever reason, I didn’t think that the “me” that I was would be good enough to keep those boys around. I felt like I needed to like what they liked in order for them to like me. I pretended to care about what they cared about. Instead of admitting that I didn’t know what in the world he was talking about when my boyfriend said, “Shreddin' the gnar”, or how to respond to whether I was “goofy” or “regular”, I pretended I did, simply to avoid the risk of “looking dumb". I wanted so badly to be perfect that in the process I lost my own authenticity. I wasn’t being real and I wasn’t being authentic. I am not an expert in lacrosse, I am not a pro snowboarder, I often wear makeup, I love my high tops... Annnnnnd I thoroughly enjoy rap music. I might not have been the girl they wanted me to be, and that is okay. I am the girl that I want to be. Each day I am growing more and more into the person that I want to become instead of pretending to be the person I “think” everyone else wants me to be. Don’t ever let anyone make you feel inferior simply because you aren’t who they want you to be. (CLICK TO TWEET).You ARE enough. Instead of striving to become the “perfect” person for someone else, strive to become the best version of YOU. Don’t be afraid to be exactly who you are. Who you are IS enough. 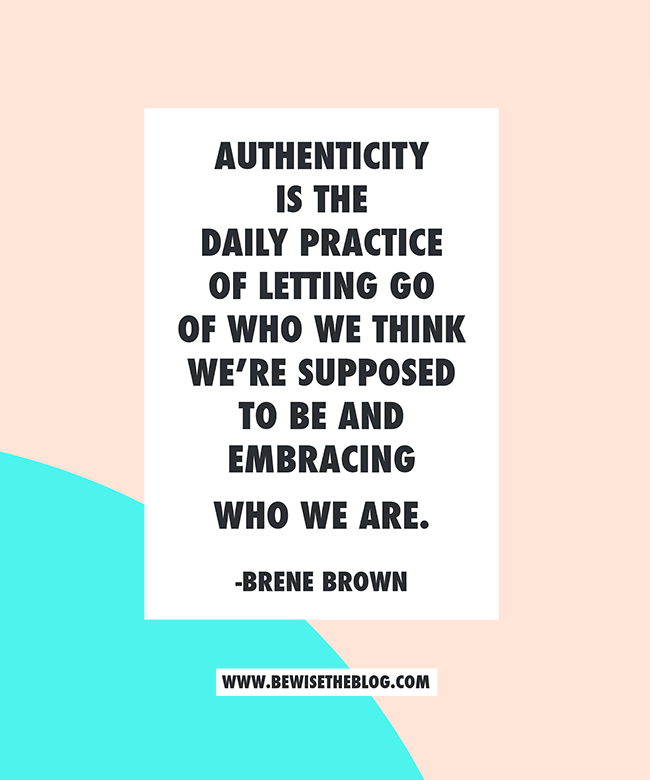 Choose to be fearlessly authentic. (CLICK TO TWEET). Look to your Heavenly Father. Trust that He loves WHO YOU ARE. Each day work on becoming the wonderful being that HE intended you to be. When have you felt like the person you were was not enough and what did you do to overcome those feelings?